Francis Askham’s The Heart Consumed (John Lane, 1944) begins in about 1845 and seems at first to be a typical costume romance. A young man, 19, delicate and rather petulant, is to enter his father’s wine trade at Bordeaux: and a French tutor is engaged for him. She is the personable daughter of an impoverished artist. The trajectory of the plot seems fairly clear. But then things take several unexpected turns. For the book becomes both a ghost story and a futuristic fantasy. I found it on Sunday 1 August 1999, a day of summer thunder and flickers of lightning, followed by a silvery downpour of fresh rain, the very weather for reading. There is no relish for the seasoning of ghost stories which will match the sound of the wind & the rain, no other sensory enhancement to such reading which can be as keenly appropriate as the feel of a storm, the pervasive presence of foul weather. Alas, this burst soon died down: and heavy humidity set in. Through this dank heat, I made my way to a book fair in a community centre. As I drove there, a moth with faded black wings, like a twist torn from widow’s weeds long laid-by, emerged from some recess of the car and beat against the windows until I was able to usher it out. Could this be a harbinger of the finding of some fine ghostly work? Not at first: all that came to hand were a few vintage thrillers. But then I noticed the slim spine in blue and pink, with the title and motif of a flaming heart, and the sign of The Bodley Head. I took out the book to look. The dustwrapper design, by ‘Holland’, was very striking, and the description alluring: the spirit of Robert Devenish ‘lives on in the London square that was once his home, searching for his lost love. Twice he finds her, for a brief space in the 1930’s, and finally over a hundred years later.’ Clearly, this must be the book that the storm and the moth had presaged. The Heart Consumed is a first novel and a very curious affair. The wraith of Robert Devenish lingers, looking and waiting, until the mid-21st century. By then, his family house has been demolished and a new university occupies the site. This is ruled by a Chancellor, a powerful public figure: lascivious, he has designs on his niece, who is none other than Devenish’s tutor. How she comes to reappear through time we are not told, although she is several times compared to a witch. Devenish’s revenant helps her in several tight corners. And the philistine Chancellor comes up against his nemesis, a languid aesthete and architect whose career he ruined, and who has secretly woven the meshes of his downfall. The scenes of the future are well-imagined, with delicate detail, thoughtfully deployed, rather than a broad sweep. Though of course not everything rings true now, it is a perceptive, quite convincing picture. The novel does have some technical weaknesses: at one point it switches for a chapter from third to first person without really signalling this: and later a letter merely repeats a scene we have just seen. But these do not detract from a highly original, peculiar story told in picturesque prose. The often grotesque minor characters are colourful, and certain natural scenes sensitively depicted. According to The Collected Non Fiction of George Orwell , edited by Peter Davison (Penguin, 2017), the author of 1984 (1949) reviewed Ashkam’s second book, whose dustwrapper contains notices of the first. As a conscientious critic, it is certainly possible that he may have at least glanced at The Heart Consumed. Could this description of a future dystopia have influenced aspects of Orwell’s book? A tempting idea, certainly: but probably not. Askham’s work has a sinister dominant (but fallible) figure, mention of several past disastrous wars, and allusions to a flattened social structure. But these are not similar enough to be obvious precursors. 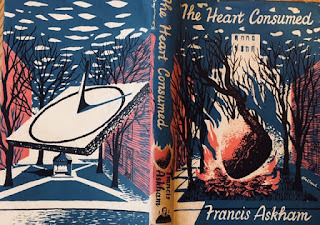 Ashkam’s novel was praised highly by Elizabeth Bowen, who said: ‘I wish to imply distinction and solid praise when I call Francis Askham’s The Heart Consumed an extraordinary novel . . .’ and indeed the book’s theme and mood have points in common with her ‘The Demon Lover’ and her novels of lovers in wartime London. There is some similarity in Askham’s book to the timeslip technique in Eleanor Smith’s Lovers’ Meeting (1940), about lovers reincarnated across time, although there the focus is much more on the romantic aspect and the partners both fully return, whereas Devenish remains a spirit only. I think there are also Aickmanesque parallels in the social satire and extravagant characters. The final book was different again. The Mayor Makers (Secker & Warburg, 1963) is subtitled ‘A social inquiry into a middle-class town . . . Number Four in a series of investigations into Living Britain 1962’. This suggests a similar technique to the noted Mass Observation surveys of twenty years earlier, reporting in detail on ‘everyday’ lives, but I wonder whether in fact all this apparatus might be a fiction. According to the British Library catalogue, Francis Askham was the pseudonym of Julia Eileen Courtney Greenwood (Orwell’s editor notes that in his review of A Foolish Wind he correctly identified the writer was a woman). R Reginald’s Science Fiction and Fantasy Literature Volume 2, has a brief entry on her. She was born on 4 November 1910, in London, and married, firstly, Antony Terry and secondly Cecil John Greenwood, and had one son. She is described as a journalist and broadcaster. Probate records show that she died on 25 January 1985 and was then living in Fitzjohn Avenue, Hampstead. She certainly possessed a remarkable imagination and unusual literary qualities and her novels at least are worth seeking out.